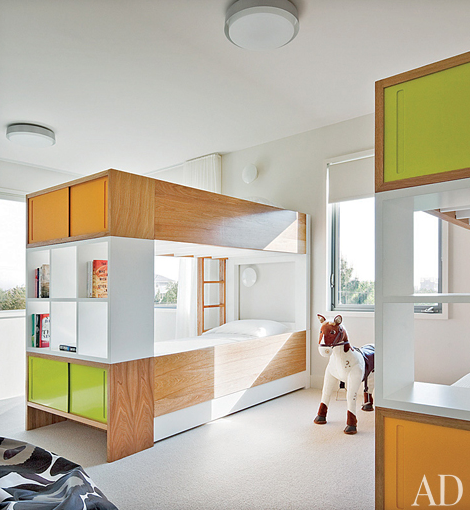 If you have a large room with tall ceilings, the duet bunk beds by Nurseryworks are one of my favorites. They offer customization of sliding storage door color and grain of wood as well as plenty of functionality with the open bookcases, optional trundle or under-bed storage and sliding side panels. They do take up a relatively large footprint so if you have a small room, they will make the space look cramped unless that is one of the only items in the room. This rooms was featured in Architectural Digest, interiors designed by Thad Hayes and photos by Scott Frances. For more bunk rooms to satiate your interest, visit my Pinterest board HERE. I think I've always loved bunk beds...never had one as a kid---but make my sophmore year bed so high it was like a single bunk with my desk area below. NICE! Nice clean-line, contemporary design with great storage capacity. Kids love bunk beds and will love the cubbies for storing kidstuff.